Opioids are powerful painkillers that act on the brain, but they have a range of harmful side effects including addiction. Researchers from the Max Planck Institute of Biochemistry (MPIB) in collaboration with researchers from the Medical University of Innsbruck, Austria, University of Innsbruck, and the Lewis Katz School of Medicine at Temple University (LKSOM), have developed a tool that gives deeper insights into the brain's response to opioids. Using mass spectrometry, they determined changes of proteins' phosphorylation patterns—the molecular switches of proteins—in five different regions of the brain and assigned them to the desired and the undesired effects of opioid treatment. Their results, which are published in the journal Science, will lead the way for identification of novel drug targets and design of a new class of painkillers with fewer side effects. The LKSOM team's participation in this research was led by Lee-Yuan Liu-Chen, Ph.D., Professor of Pharmacology in the Center for Substance Abuse Research. Other researchers contributing to the study from LKSOM are Chongguang Chen, a research technologist and Yi-Ting Chiu, a former postdoctoral fellow, in Dr. Liu-Chen's group in the Center for Substance Abuse Research. The signal cascades that are used by cells to respond to external stimuli resemble the chain of command of a company. Activation of a receptor, which acts as the head of the company, gives instruction to other proteins inside the cells, which act as groups of subordinates. This information is then passed down to lower levels of the organizational structure via signal cascades of other interacting proteins. Like the employees who perform different tasks to keep a company running, proteins are the molecular machines that conduct majority of functions in the cells. In cells, instructions are passed along to other proteins by changing the function of these 'cellular employees'. One way to change the function is by "phosphorylations—the attachment of a phosphate molecule to proteins. By analyzing all the molecular switches at the same time, activity of signaling pathways in cells or an organ can be determined. Studying this chain of command gives a more precise insight into the currently occurring processes within cells than studying the DNA, the genetic "blueprint", which is almost identical in all cells. Researchers in the laboratory of MPIB director and co-corresponding author on the study, Matthias Mann, use mass spectrometry—a method that determines the identity and quantity of proteins in a sample—to describe phosphorylation patterns of thousands of proteins in many organ specimens, a term coined as phosphoproteomics. In the recent study, they analyzed the activation of signaling pathways in different regions of the brain, responding to opioid-like drugs. To achieve this goal, the researchers used a recently developed method named EasyPhos. To understand how drugs like opioids work, researchers must know their influence on the brain. "With phosphoproteomics, we can analyze more than 50,000 phosphorylation sites at once and get a snapshot of all pathways that are active in the brain samples during that time. We found more than 1,000 changes after exposure to an opioid-like drug, showing a global effect of these drugs on signaling in the brain," says Jeffrey Liu, the lead author of the study. Previous methods could not capture protein phosphorylations at a comparable scale and missed many important signaling pathways that were switched on or off. "In our study, we looked at activation of pathways in the brain that are responsible for desired effects of opioids like painkilling. In contrast, the parallel activation of other pathways causes undesired side effects", says Liu. The researchers used phosphoproteomics to measure how active these beneficial and side effects-causing pathways were. Christoph Schwarzer from the Medical University in Innsbruck, who collaborated with Liu and Mann for this study, focuses his research on these opioid-activated signaling cascades in the brain. During the development of new drugs, these data can be used to identify potential substances that give strong therapeutic benefits and have few side effects. In addition, this study also shows the promise of reducing side effects by interfering with signal cascades. So this study introduces a novel concept for opioid-based therapeutics. Current drugs of the opioid family are potent painkillers but quickly lead to addiction. Thus, there is an urgent need for novel non-addictive opioids. Imagining the proteins in the brain as a company, phosphoproteomics allows the researchers to follow the activity of all employees at once instead of focusing on a selected few. Mass spectrometry can be a powerful tool to study drug targets in the brain or other organs. 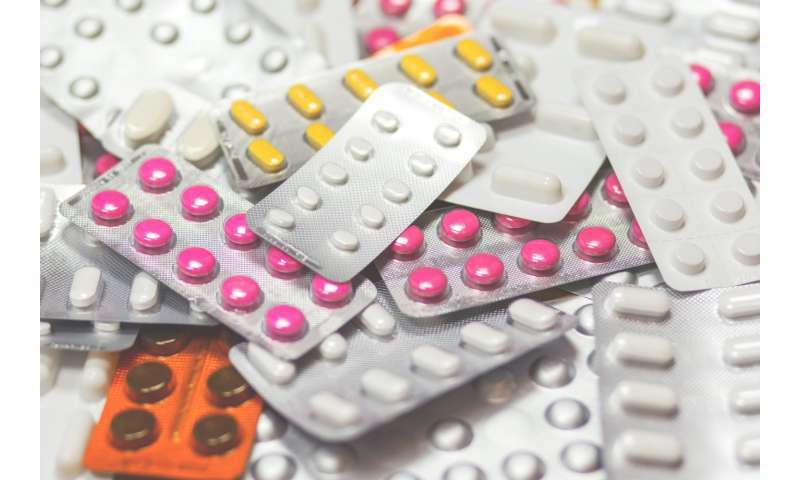 The mass spectrometry expert Matthias Mann says, "The current epidemic of opioid-related deaths in the US is a shocking example for the potential consequences of prescription drugs with strong side effects like addiction. With mass spectrometry, we can get a global view of the effects of drugs and streamline the development of new drugs with fewer side effects." Mann explains that the design of new drugs is just one of many potential applications of phosphoproteomics and predicts that the method can also be used to generate knowledge on how cells use their chains of command to process information and the effects on drugs in other organs. Dr. Liu-Chen's group performed behavior experiments using two drugs and found that they have similar analgesic effects, but very different levels of side effects. Brains of animals treated with the two drugs were analyzed by MPIB for phosphoproteomic differences, which were found to belong to a few signaling pathways. Inhibition of one of the identified pathways greatly reduced some of the side effects.